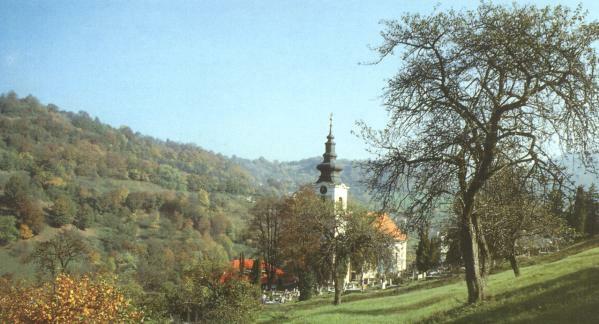 Village 6km long is sweeping along dale of a brook in a valley of the Štiavnické mountains. The first written mention originates from the 13th century about a mine habitation, later about a habitation with an amount of specialists to be good at iron production and of craftsmen for its manipulation. There was a seat of Knights-Templar , who produced the first drops of a drink – a famous beer from Vyhne. The second famous fluid is water from thermal spring , which had been used for more than 700 years ago for its refresh effects after working. They found out warm water has its healing effects. František Rákoczi II. wanted to build watering-place like in Karlove Vary here. But with the end of the World War II. finished glory of the spa, which used to accomodate 1000 guests in season 100 years ago. Nowadays you can find here silence, peace, bird singing and endless concerts of crickets, opportunity of tourism and cyclist trips , bathing in summer thermal bassin, tennis and volleyball courts, football stadium, biathlon area, in winter opportunity to go skiing, discos and an excellent care of rehabilitation workers in rehabilitation part of the hotel Sitno. In the village take place many important sport and cultural undertakings for example: international volleyball competition, biathlon tournament, sculptural and paint symposium a.o. Ancient Banská Štiavnica 12km away from Vyhne offers an opportunity to use your leisure time actively and with interest.